Khanom chin are fresh, thin rice noodles in Thai cuisine which are made from rice sometimes fermented for three days, boiled, and then made into noodles by extruding the resulting dough through a sieve into boiling water. Khanom chin is served in many kinds of stock: coconut milk, fish curry, and chili. Khanom in Thai usually refers to desserts, but in a wider sense can denote foods that use any type of flour as its main ingredient. Although chin means “Chinese” in Thai, this type of noodle originated from the Mon people who inhabited the region which is now central Thailand before the arrival of the Thai people from southern China. 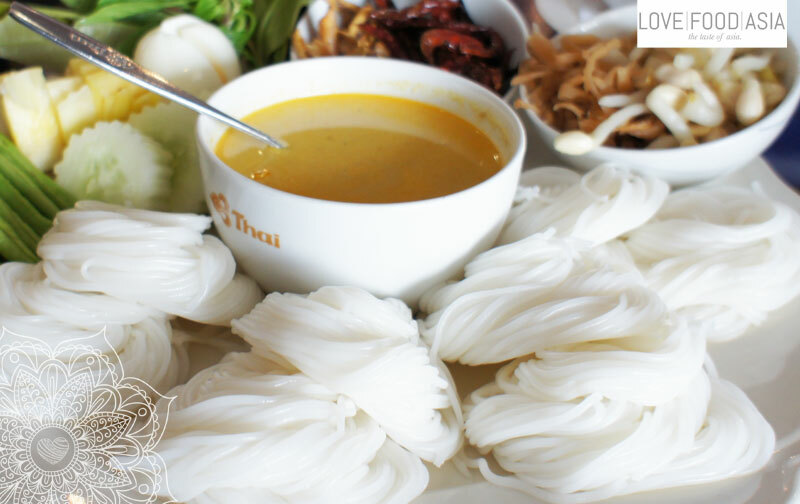 There are many delicious Thai dishes with this thin rice noodles. Most of them are based in Central Thailand. On the picture you can see a breakfast plate in central Thailand.